The knight has the same value as a bishop. 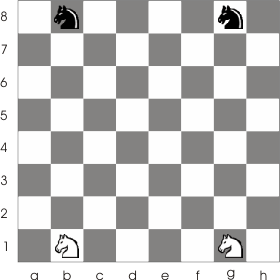 That means that it has a value grater than that of the pawn but smaller then those of the rook and queen. 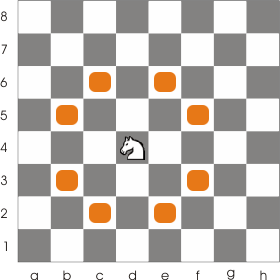 You can see the initial positions of the knights in the following image. The knight is the only piece that can jump over other pieces may this be enemy pieces or pieces in its own team. It has a relatively short range of action in comparison with the bishop but it compensates that with the fact that it can jump over other pieces. It moves in any direction over two squares in a line and then over one square in a diagonal. But to put it more simply it moves in an L trajectory, the 'L' being composed of 4 squares. Look at the board below to get the idea. It can only capture the piece that is on its destination square. It can't capture the pieces over which it jumps. When it captures a piece it takes its place. 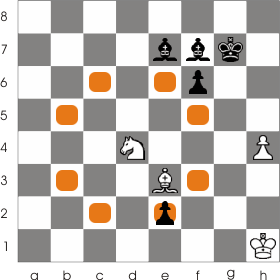 You can see in the example above that the knight at d4 can capture the black pawn at e2. It does this by taking its place. Notes that it has no problem with the bishop at e3; it simply jumps over it.